Youth Ministry calls for passion, patience, and faithfulness. Our whole parish is committed to walking faithfully with our young people as they transition into young adulthood. By placing our focus on education, friendship and formation we hope to foster lasting transformation in the teens of our parish. Responding to the spiritual needs of teens is about building trusting relationships. 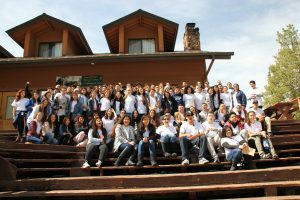 St. Margaret Mary’s leadership strives to walk with young people on their journey from childhood to adulthood, recognizing their gifts for ministry, their questions about spirituality, and their desire to make a difference in the world. The Youth Ministry program is grounded in a desire to invite, inspire, affirm, and equip youth for discipleship and Christian leadership both in their lives and in their community. Join us every Sunday after the 5:00pm Mass to participate in one of our great youth gatherings or check the bulletin to discover our monthly activities and special events. All are welcome!